...Alone in his never-finished, already decaying pleasure palace, aloof, seldom visited, never photographed, an emperor of new strength continued to direct his failing empire, varyingly attempted to sway as he once did the destinies of a nation that had ceased to listen to him, ceased to trust him. Then last week, as it must to all men, death came to Charles Foster Kane. The News on the March newsreel film abruptly ends, distorting the final moments of sound. It isn't enough to tell us what a man did. You've got to tell us who he was. Maybe he told us all about himself on his deathbed...Yeah, maybe he didn't...All we saw on that screen was a big American...One of the biggest...But how is he any different from Ford? Or Hearst for that matter? Or John Doe...I'll tell ya, it comes from a man's dying words...What were they?...You don't read the papers...When Charles Foster Kane died, he said just one word -...Rosebud, just that one word, but who is she...What was it?...Here's a man that could have been president, who was as loved and hated and as talked about as any man in our time. But when he comes to die, he's got something on his mind called 'Rosebud.' Now what does that mean?...A racehorse he bet on once...Yeah, that didn't come in...All right, but what was the race? Get in touch with everybody that ever knew him, oh, knew him well...that manager of his, uh (snaps his fingers) - Bernstein - his second wife - she's still living...Susan Alexander Kane...She's running a nightclub in Atlantic City...See em all. Get in touch with everybody that ever worked for him, whoever loved him, whoever hated his guts. I don't mean go through the city directory, of course...Rosebud, dead or alive. It will probably turn out to be a very simple thing. Each of the five sources from which the dogged reporter receives his information serve to introduce six separate sections of the remainder of the film. The sections are not structured chronologically, yet they progressively follow the memories of Kane's life in logical stages. At the conclusion of the non-traditional, non-linear narrative, it is concluded that none of them know the implications or meaning of the word 'Rosebud' - a possible clue to the meaning of his life. Susan: Who told you you could sit down? Thompson: I thought maybe we could have a talk together. The head nightclub waiter/captain John (Gus Schilling) brings her a mixed drink and then attempts to soften the rebuke and explain her mourning: "She just won't talk to nobody, Mr. Thompson...She'll snap out of it. Why, 'til he died, she'd just as soon talk about Mr. Kane as about anybody." After calling in to Rawlston on the phone (in a phone booth) to tell his chief that the second Mrs. Kane "won't talk," Thompson asks the waiter whether Mrs. Kane ever mentioned 'Rosebud.' After pocketing a bill to make him talk, the waiter remarks that he had asked her the same question when Kane's death hit the papers, and she responded: "She never heard of Rosebud." The scene fades quickly to black. At a desk, a mannish, stern and severe-looking librarian instructs him about the restricted use of Thatcher's unpublished memoirs. The sound of Thompson's footsteps echo through the marble halls of the mausoleum-like building as he is led to one of the reading room vaults (resembling a bank vault). Shafts of dusty sunlight pierce the room, as in the earlier projection room. A guard removes one of the revered volumes - a diary - and bears it in his arms toward Thompson. There, sitting at a long table, Thompson is confined to inspecting pp. 83-142, the pertinent parts of Thatcher's manuscripts-diaries-journals. He is also told that he must leave at 4:40 pm sharp. The door closes shut on the face of the subjective camera (imprisoning it and Thompson himself). Then a dissolve moves beyond the door and moves to peer over Thompson's shoulder at the pages of the book. I first encountered Mr. Kane in 1871. Inside the cabin, the camera remains stationary at the table where they negotiate Charles' future. With Kane's rustic, "uneducated" father anxiously haranguing them on the left of the frame (complaining: "You people seem to forget that I'm the boy's father...I don't hold with signing my boy away to any bank as guardeen..."), well-dressed Thatcher officiously sits next to Mrs. Kane on the right (in close-up) as she signs legal papers to appoint Thatcher as Charles' guardian. The boy can be seen as a tiny figure (and heard yelling "The Union forever!") playing with his sled in the snow through the distant window in the center of the frame. The boy's stern, emotionally-controlled mother gives her child up and signs the papers. She appoints the banking firm of Thatcher and Company to manage all her financial interests, to administer her estate, and to act as trustees of the fortune and guardian of her son. Mr. and Mrs. Kane will each be given $50,000 a year - the rest of the fortune will be placed in a trust fund for Charles until he reaches maturity at age 25, at which time he would come into complete possession. Why, we're going to have some fine times together, really we are, Charles. Now, shall we shake hands? (Charles pulls back) Oh, come, come, come, I'm not as frightening as all that, am I? Now, what do you say? Let's shake. Upset and reluctant to leave, the bratty boy violently rams Thatcher with his sled and then is struck by his father. He glares knowingly at Thatcher, aware that he is being taken away from his innocent childhood and mother - sent east to be cultured, educated and raised under Thatcher's stern guidance. After he has departed, the camera shot dissolves to a long-held closeup of Charles' abandoned sled on a snowbank - it is gradually covered by a cold snowfall - a preserved (and buried) symbol of vanished innocence, loss and purity. Significantly, the name of the sled - Rosebud - is completely obscured - although it is symbolic of the 'cold' life where Charles will be taken. A train whistle is heard leaving town, symbolic of his unhappy transfer to Chicago. Having reached legal maturity, and with the proper background and training to manage his acquired wealth, the full estate becomes his and he acquires control. Thatcher dictates a memo to that effect: "...may I again remind you that your twenty-fifth birthday which is now approaching marks your complete independence from the firm of Thatcher and Company as well as the assumption by you of full responsibility for the world's sixth-largest private fortune." Sorry but I'm not interested in gold mines, oil wells, shipping or real estate...One item on your list intrigues me, the New York Inquirer, a little newspaper I understand we acquired in a foreclosure proceeding. Please don't sell it. I'm coming back to America to take charge. I think it would be fun to run a newspaper. I think it would be fun to run a newspaper. Grrr. Soon, Kane uses the paper to attack trusts, Thatcher and others among America's financial elite. Headlines of the Inquirer blare out the expose in a montage of early Inquirer newspaper headlines: "TRACTION TRUST EXPOSED," "TRACTION TRUST BLEEDS PUBLIC WHITE," and "TRACTION TRUST SMASHED BY INQUIRER." Other social causes are heralded by the paper: "LANDLORDS REFUSE TO CLEAR SLUMS! !," and "INQUIRER WINS SLUM FIGHT." The paper also attacks capitalistic Wall Street itself: "WALL STREET BACKS COPPER SWINDLE!!" and "COPPER ROBBERS INDICTED!" I don't know how to run a newspaper, Mr. Thatcher. I just try everything I can think of. Thatcher explodes at him, accusing him of following a radical policy at the paper of concocting stories: "You know perfectly well there's not the slightest proof that this Armada is off the Jersey coast." 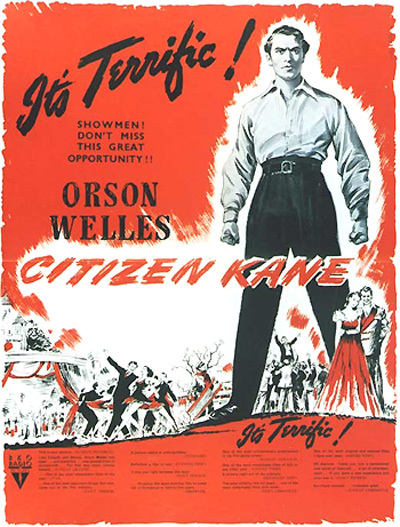 Kane is informed by his assistant Bernstein (Everett Sloane) that a correspondent named Wheeler in Cuba has sent a communique: "Girls delightful in Cuba stop. Could send you prose poems about scenery but don't feel right spending your money stop. There is no war in Cuba. Signed, Wheeler." Kane calmly tells his assistant to answer the war correspondent [a dictation that echoes one of William Randolph Heart's most famous quotes in the yellow press to artist Frederic Remington regarding the 1896 Spanish-American War]: "...you provide the prose poems, I'll provide the war." The trouble is, you don't realize you're talking to two people. As Charles Foster Kane, who has 82,634 shares of Public Transit Preferred. You see, I do have a general idea of my holdings. I sympathize with you. Charles Foster Kane is a scoundrel. His paper should be run out of town. A committee should be formed to boycott him. You may, if you can form such a committee, put me down for a contribution of $1,000 dollars. On the other hand, I am the publisher of the Inquirer! As such, it's my duty - and I'll let you in on a little secret, it's also my pleasure - to see to it that decent, hard-working people in this community aren't robbed blind by a pack of money-mad pirates just because - they haven't anybody to look after their interests. Thatcher reminds Kane that his philanthropic paper enterprise is losing a million dollars a year. Kane blithely jokes that "at the rate of a million dollars a year, I'll have to close this place - in sixty years." ...to buy things. Buy things. My mother should have chosen a less reliable banker. Well, I always gagged on that silver spoon. [This is Kane's first of only two mentions of his own mother in the film.] Then, he congratulates himself in a remark directed at Bernstein: "You know, Mr. Bernstein, if I hadn't been very rich, I might have been a really great man...I think I did pretty well under the circumstances." But it is Thatcher who responds: "What would you like to have been?" Kane shows his contempt for Thatcher in his brooding answer, implying that he has turned into something like Thatcher himself: "Everything you hate!" The scene returns to the Thatcher library, where Thompson is told that his time is up for the day. The attendant asks if he has found what he was looking for in his "very rare privilege" at the library. Thompson, of course, replies that he has not, and then impulsively and playfully asks her: "You're not Rosebud, are you?"